Embrace the true spirit of the season with these wonderful Christmas Carol Concerts in the town & country. Childline’s Merry Little Christmas Concert is set to ring through Holy Trinity Sloane Square. It will be an evening filled with magical classical music as well as traditional carols, plus celebrity readings and guests will receive a festive treat from Lindt. St Martin-in-the-Fields will be hosting a number of Christmas carol services and Christmas concerts, starting with John Landor’s Family Christmas Concert with Audience Carols on Saturday 1 December at 4pm. A series of carols and concerts will take place throughout the festive period, including A Festival of Carols by Candlelight on Saturday 8 December. Carols will include all the time-honoured classics such as ‘Hark! The Herald Angels Sing’, ‘O Come All Ye Faithful’ and ‘God Rest Ye Merry Gentlemen’. At Central Hall Westminster, located opposite Westminster Abbey, a number of carol concerts will take place on both Fridays and Saturdays between 14-22 December. During the day there will be Christmas Carol Singalong concerts, hosted by Jonathan Cohen, and in the evenings visitors can attend Carols by Candlelight, staged in full 18th Century costume in an evocative candle-lit style setting. 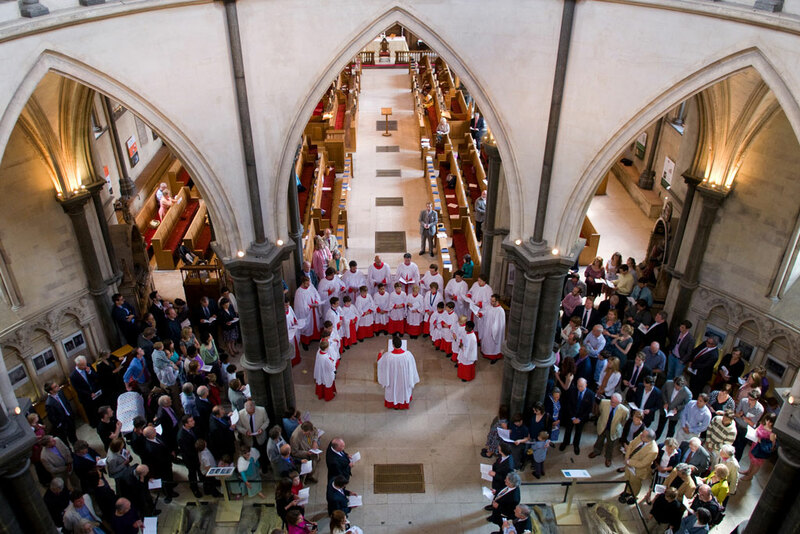 St Clement Danes Church will be holding several Christmas services and concerts, beginning with the Friends of St Clement Danes Concert on 29 November. Their next service will be held at on 2 December, where there festive season will be celebrated with the Advent Sunday Carol Service. A full list of carol services will soon be available, but for now mark your diaries for festivities on the 2, 9, 11, 16, 23 and 24th! The opening concert of the Temple Winter Festival will feature the Temple Church Choir performing classic and traditional tunes in the serene setting of the Temple Church, just off Fleet Street. The festival brings together some of the UK’s most amazing choral talent, so the opening concert starting off this seasonal affair should not be missed on December 10th, 7.30pm. For the second year running Dogs Trust, the UK’s largest dog welfare charity, is hosting a carol concert to raise funds for the dogs whose owners are either homeless or in housing crisis. Held at Chelsea Old Church, SW3, on Wednesday 28th November, the Staffie Sopranos and Terrier Tenors will be howling along with guests to traditional carols and festive readings. Doors open at 6pm with carols starting at 6.30pm and tickets are priced at £40 for adults, £10 for children and all well behaved dogs are welcome. Visitors are invited to sing carols at unique 13th century St Giles Church, hidden away deep within a ghost village inside the Army’s Salisbury Plain Training Area. As in previous years, the Bratton Silver Band and the Westbury and District Choral Society will provide you with music for the Christmas season. Mince pies and mulled wine will be available on arrival, and tickets will be available from 1 November. York Minster’s Christmas Carol Concerts take place on Thursday 14 and Friday 15 December and offer the perfect start to the festive season. The concerts feature the York Minster Choir performing a mixture of classical and popular Christmas music, with the Yorkshire Volunteers Band leading the audience in Christmas carols. The concerts will take place in the Minster’s Nave and each evening will include seasonal readings by two celebrity readers (details to be announced). Tickets are from £12-£25. The candlelit carol service in the stunning 15th century Holy Trinity Church in York, accessed through a hidden doorway off the busy shopping streets of York, will take place on 7 December at 6pm. This year, the annual carol service at St Mary’s Church in a working farmyard will be held on Sunday 18 December, and visitors are invited to stay on afterwards for mulled wine and mince pies. The annual carol service at St Mary’s Church in North Huish on 10 December is the final service of the year at this beautiful 15th-century, stone-spired church in a fold in the hills just below Dartmoor. St Mary’s is as beautiful on a winter’s afternoon as in high summer and visitors to the area are invited to join in on Christmas celebrations.